Living with a failing or missing tooth is challenging! Chewing and eating the foods you once enjoyed becomes difficult, and this may affect your nutrition. It also takes a toll on your confidence as talking and smiling in front of others may feel embarrassing. This affects your personal and professional relationships. 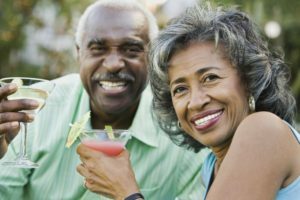 The good news is that there are excellent options for replacing teeth and dental implants in Bay Shore that may be the solution you’re looking for. When your tooth is removed, your jawbone no longer has a root to support. This causes your bone to deteriorate, which eliminates support for your remaining teeth, and also changes the appearance of your face. Without a replacement tooth, your healthy teeth begin to shift into the open space. This causes bite misalignment and puts your teeth at risk for fractures or other damage. If you have a compromised tooth it’s a good idea to replace it as soon as possible in order to protect your oral health. A dental implant restores both your tooth and your root. A biocompatible titanium post is placed into your bone during a simple surgical procedure. It will naturally integrate with your bone over time, and this creates the foundation for your new tooth, while also keeping your bone healthy. Your new tooth is made of high quality porcelain that is customized to mimic your natural tooth in both shape and aesthetics. You’ll enjoy all the function you had before, and your implant will naturally complement your smile. No one will ever know you were missing a tooth! Dental implants are also easy to care for as you’ll be brushing and flossing as you were always used to. They are a smart investment in your oral health as they offer great longevity. With excellent home care and regular dental checkups, your implant can potentially last for a lifetime. Dental implants do require a couple of things to be successful. First, the patient should be in good overall health. Next, there has to be enough healthy bone structure present to properly support the dental implant. Your team at East Islip Dental Care can help determine if dental implants are right for your needs with a thorough examination and x-rays. We’re happy to guide you through the process from start to finish. If implants are not in your future, our doctors can discuss other options for restoring your teeth. Would you like to learn more about how dental implants can help you? Contact your implant dentist in Bay Shore today to schedule a consultation.